AeroTEC holds an FAA Parts Manufacturer Approval (PMA) certificate and offers a host of manufacturing capabilities to support all your flight test equipment needs. From rapid prototyping and tooling to testing equipment, wind tunnel models, and load alleviation systems, we work to provide solutions for success! Through our CAD software, we provide instrumentation designs, fabrication and installation kit drawings, mechanical design, detail and assembly drawings, and wiring harness diagrams. AeroTEC uses high-end CAD/CAM/CAE Unigraphics NX software for 3-, 4-, and 5-axis manufacturing. We can also program g-code for a wide variety of CNC equipment. We offer first tier precision machining with our in-house machine shop capabilities. 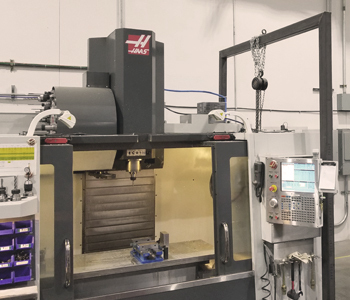 Our specialized equipment includes a 3-axis 12-foot bed CNC mill, a 4-axis 4-foot bed CNC mill, a 2-axis CNC lathe, and a 2-axis CNC router for tooling foam and flat pattern sheet metal. Additionally, our precision machining is inspected and substantiated using our state of the art FARO arm 3D laser scanner. We have inhouse capabilities to manufacture sheet metal parts including but not limited to forming, bending and routing of detailed sheet metal parts. Our woodworking shop allows us to produce project support equipment, including frames, test benches, and ballast boxes. Most tooling and mold fiberglass parts are produced in-house. We coordinate composite parts manufacturing through our first tier suppliers. Our high-resolution laser scanner supports part inspection, reverse engineering and surface scanning. Through our first tier supplier, we can expand our measurement capabilities to meet any project requirement. AeroTEC offers priming, painting, and anodizing of small parts. Aerospace and military spec surface finishes, zinc plating, cadmium plating, powder coating and thermoplastics, and priming and painting of larger parts are available through our suppliers. Our comprehensive wire shop allows us to conduct a number of wiring tasks from building up avionics and flight test wire bundles to testing and modifying wire bundles. Contact us to learn how our many in-house manufacturing services can benefit your program’s design, test, and certification.